UF Health Shands Children’s Hospital is one of the few children’s hospitals in the country that has a whole program based on caring for patients with congenital diaphragmatic hernia. From prenatal diagnosis, evaluation and counseling, through exacting and consistent care of CDH newborns from birth to discharge, to a CDH follow-up clinic, our program has a structure dedicated to providing CDH children the highest levels of outcome and follow-up available anywhere. CDH in a fetus (unborn baby) or newborn occurs when the diaphragm on one side, usually the left, fails to fully develop during pregnancy. 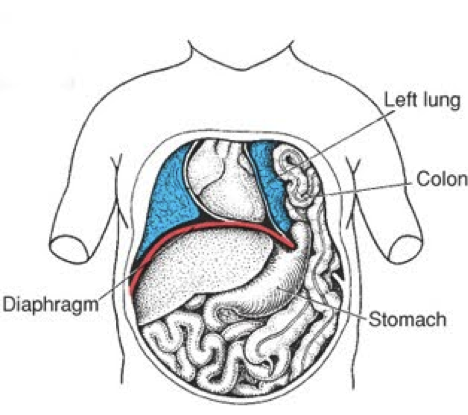 Since this muscle separates the chest from the abdomen, abdominal organs migrate into the chest, where they impede lung development and push the heart to the other side. This condition is a spectrum of severity, but can lead to lungs which are barely large enough to support life. Nationally, a third or more of these babies die even when treated at good centers. Most cases of CDH are diagnosed before birth and parents may be given a poor prognosis for their unborn child. At UF Health, our program specializes in the care of CDH, and while we can never promise survival or a specific outcome, we believe that each CDH baby deserves a chance. We have treated over 300 CDH infants, and for patients that don’t have a second life-threatening birth defect in addition to their CDH, survival approaches 90% (99% for left CDH with liver in abdomen, 92% for right CDH, and 75% for left CDH liver in chest, overall 88%. Annals of Surgery 2013). The team at UF Health Shands Children’s Hospital has been treating children with CDH for over twenty years. We provide around-the-clock care for CDH babies, from birth to discharge, emphasizing lung protection and brain protection and an individualized treatment strategy based on risk stratification. As part of an academic health system, we are actively involved in research about the treatment of CDH to increase survival rates and optimize outcomes. Since the program’s start, we have consistently employed gentle ventilation techniques to avoid further damage to baby’s lungs, a treatment that has gradually become mainstream. We continue to evaluate ways to improve outcomes, including identifying the best ways to improve lung function, as this optimizes survival, and to protect brain cells, as this optimizes the quality of outcome. A heart-lung bypass procedure called ECMO (extra-corporeal membrane oxygenation) to support the most severely affected (30 percent) of these babies. The goal is always to minimize the need for ECMO, while maximizing the benefit for those patients that do need it. Variable surgical repair timing to optimize the benefits of CDH repair while minimizing risk. High level of consistency of care: One team and protocol oversees the totality of care from birth to discharge, including the ventilation, repair, and extracorporeal membrane oxygenation (ECMO) if needed. Each of our locations is designed with kids in mind. The décor features colorful, nature-themed art and is playful, yet warm and inviting. UF Health acute care surgeons work with surgeons, nurses, and social workers to provide thorough and compassionate care for children with burn injuries, severe skin disorders, difficult or chronic wound problems.